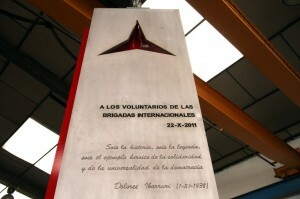 The events commemorating the 75th anniversary of the founding of the International Brigades have begun. Tomorrow will see the unveiling of a new, 12-foot monument to the IB on the campus of the Universidad Complutense, featuring the three-pointed star and the famous lines with with Dolores Ibárruri bade farewell the the IBers in October 1938 (“You are history, you are legend…”). Representing ALBA are James D. Fernández and Marina Garde (in Madrid) and Robert Coale (in Barcelona). For the full program of events in Madrid, see here. Press coverage: El País, Público.